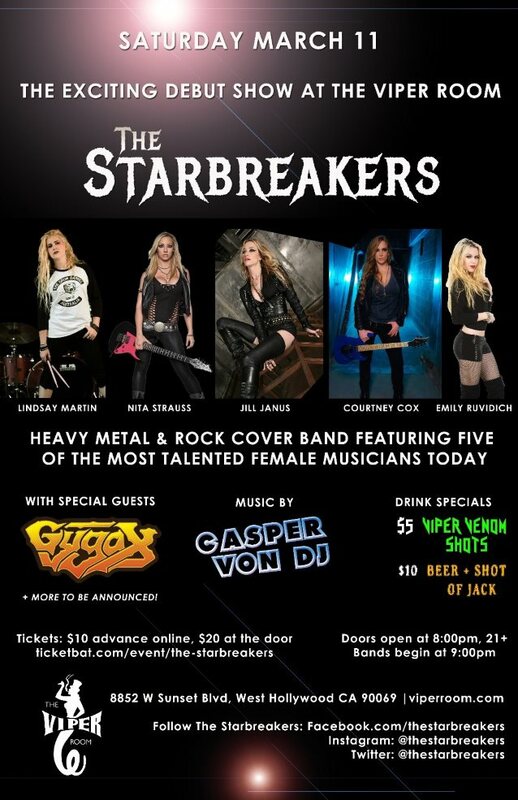 THE STARBREAKERS will debut at The Viper Room in West Hollywood, California on Saturday March 11. The all-star cover band features five of the most talented female musicians today. With unparalleled musicianship and looks that kill, they've mastered the art of the cover song — delivering a mind-blowing live show and unforgettable party. THE STARBREAKERS are professional international touring and recording artists, five blonde superstars who will rock your night and break your heart! Jill Janus began her musical journey as a child performing opera in Upstate New York. As a teenager, she traveled to Europe taking on coloratura soprano roles and was awarded a scholarship to the American Musical Dramatic Academy in Manhattan. Besides having a wealth of performances as a vocalist, Jill also had a very successful career as an international DJ in her 20s. Her charismatic persona and rare four-octave vocal range have made her one of the most unique performers in heavy metal today. With her band HUNTRESS, she's released three albums and toured the world with heavy hitters LAMB OF GOD, ARCH ENEMY and AMON AMARTH, to name a few. Having previously fronted the all-girl cover band CHELSEA GIRLS, Jill is thrilled to return to the stage once again performing cover songs with THE STARBREAKERS. Los Angeles-born guitarist Nita Strauss has become a force to be reckoned with in the music world, dazzling audiences across the globe, and sharing the stage with a diverse range of artists, including rock legend Alice Cooper, R&B star Jermaine Jackson, early MTV darlings FEMME FATALE, video game supergroup CRITICAL HIT and popular tribute band THE IRON MAIDENS. Her skill, exuberant stage presence and love for all things about her instrument have earned her a stellar reputation and endorsements from many top companies. 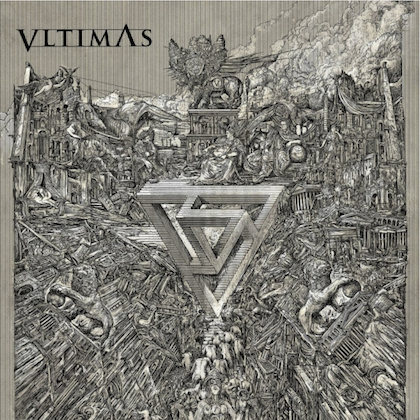 Nita has been featured on the covers of worldwide print magazines and on dozens of albums, trailers, and soundtracks, including "Heroes Of The Storm" (Blizzard) and Grammy-nominated "Metal Gear Rising: Revengeance" (Konami/Platinum Games); and is the author of the Premier Guitar column "Drop Dead Shred". Nita was also the official in-house guitarist for the LA Kiss, the arena football team owned by Paul Stanley and Gene Simmons of KISS. She is one of the most sought-after clinicians in the industry and has done extensive clinic tours across multiple continents. Her consistent touring schedule has shown her to play in front of over a million audience members in both 2014 and 2015. Nita is currently playing guitar for Alice Cooper and working on original solo material. Courtney Cox, originally from Philadelphia, first picked up a guitar at the age of 13. While still in her teens, she received immense practical exposure during her tours and stage acts with established artists such as Adrian Belew, Jon Anderson, Perry Farrell and George Lynch. She co-founded QUEEN DIAMOND, a tribute band to KING DIAMOND. Courtney moved to Los Angeles in 2009, after which she officially became a member of the world-touring tribute band THE IRON MAIDENS. As a member of THE IRON MAIDENS, Cox's stage name is "Adriana Smith", a female version of IRON MAIDEN guitarist Adrian Smith. Courtney has also been a full-time member of FEMME FATALE since 2013. Lindsay Martin grew up in Upstate New York and started playing drums at the age of ten. Being an accomplished drummer at a young age, she earned a scholarship to USC's Music Program. Lindsay's spent time touring Europe, worked as a respected drum technician and volunteers her skills at music camps for kids. Previously she's played with THE AVIATORS and GLAM SKANKS. She's known for her aggressive rock n' roll style and precision, citing Tommy Lee and John Bonham as influences. Emily Ruvidich is a multi-faceted musician. In addition to guitar and bass, she's an accomplished classical pianist. Although she's only twenty years old, Emily has toured nationally with several tribute bands and is currently holding down a residency in Las Vegas with all-girl cover group MISTY DAY, playing guitar and keyboard.